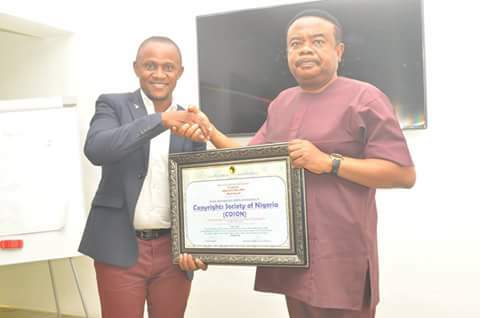 The magnificent COSON House in Ikeja on Friday February 23, 2018 played host to several students from around the African continent as COSON Chairman, Chief Tony Okoroji was bestowed with the prestigious ‘‘Africa’s Patriotic Personality Award’’ by the League of African Development Students (LEADS Africa) – an umbrella body of democratic Students Union from different countries in Africa. The 6-member team of LEADS Africa consisted of Njoku Obioma Daniel from Enugu State University, Abayomi Okuwoga from Lagos State University, Okafor Obiageli from the University of Benin, Benin Republic, Osisiogu Osikenyi from the Institute of Technology, Accra, Tagheli Jean Bedel from the Universite De Yaoundé and Morgan Gabriel from the University of Professional Studies, Accra, Ghana. ‘‘I want to thank you all exceedingly on behalf of my family and on behalf of the management, staff and members of COSON for the honour you have done to us today. We say Thank you.’’ He concluded. On hand to receive the team were the COSON General Manager, Chinedu Chukwuji, COSON Consultant, Prince Biodun Eguakhide, COSON Head of Finance and Administration, Bernice Eriemeghe, COSON Head of Corporate Affairs, Chibueze Okereke and COSON Head of New Media, Tolu Balogun.